Every spring when cherry tree starts blossoming my heart is filled with excitement with anticipation for the double flowered cherry blossoms. Some cherry trees bear flowers that has more than 5 petals, some with 100, covering the tree with masses of pink flowers. In Japan we pickle them in salt first, then in lemon or vinegar to preserve the colour and flavour. The salt, in which pickled blossoms are stored that turns pink, makes a wonderful seasoning for fish and vegetables. I thought about this recipe when I knew that we can now buy Takana in UK, pickled mustard leaves, my favourite pickles of all times. Eat small amount of takana with every mouthful of delicately flavoured rice. The rice dish cannot be more elegant. 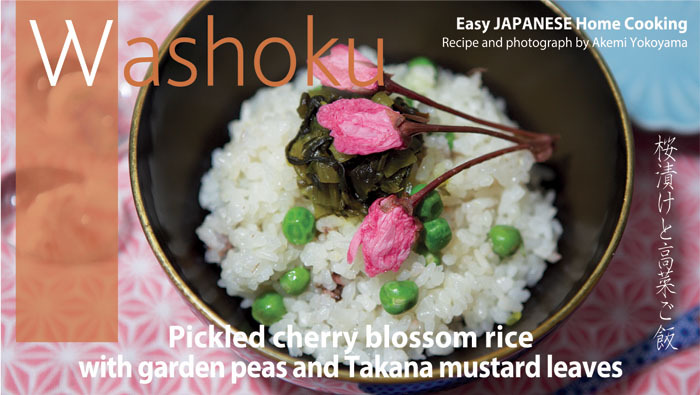 To make pickled cherry blossoms, you need double-flowered cherry blossoms, salt and lemon. Gently wash the flowers in a bowl of water. Lay a sheet of kitchen towel, spread the flowers in single layer and press with another kitchen towel to dry. Make layers of flowers and salt in a freezer bag to pickle. Close the bag firmly without the air, store in the fridge with a jar on top for overnight until the water comes out of the flowers. Squeeze the water out of the flowers, put them into a clean freezer bag, add lemon juice. Remove the air from the bag and close. Store them under a jar in the fridge for another 3 days. Take the flowers out of the bag, spread them over kitchen towel to dry in a cool shady place for further 3 days. Store them in a clean jar with plenty of salt to flowers. It will keep for a few years in the fridge. You may soak in cold water before use, or use as they are for cooking. Soak several pickled cherry blossoms in water to remove salt to use for decoration. Dry and set aside. 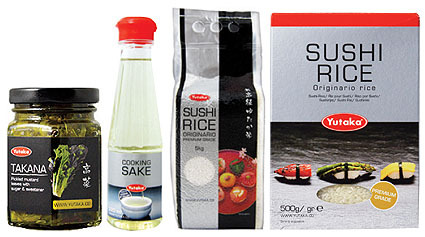 For sushi rice, wash the rice in a pot rinsing with fresh running water until the water becomes clear. Use a strainer to drain the water. Move the rice after 30 minutes into a pan and add the water, the rest of the pickled cherry blossoms with salt and sake. Bring to a boil over a medium to hight heat, then turn the heat right down and simmer for 15 minutes. Turn off the heat and add garden peas. Let it rest for 10 minutes. Serve with cherry blossom and takana.